People often use quizzes for their lead generation funnel where after finishing a quiz people need to leave an email to see a result. Then you may send personalized email series based on their outcome. However, lead generation is just a small piece of the whole sales process. 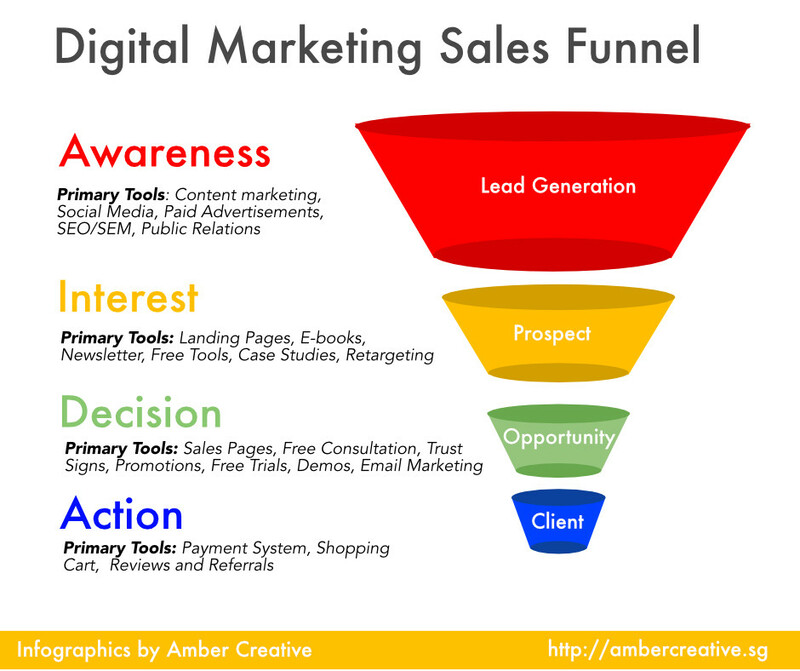 A team from AmberCreative put together an infographic on the sales funnel. Awareness. People come to your web site from Google, social media, through advertising, etc. At this point, they are your prospects. Interest. Whether they find your site through a search engine or you drive them to your landing page, get their attention and encourage them to leave you their email for example as an exchange for a freebie. Now they become your leads. Decision. Next is the period when people make a choice if they want to buy your product or service. You engage with them through your content and market using emails, follow up with the phone calls, and make your best offers that will lead them to the sale. Action. Then the result you lead people to is actually buying what you offer. While it’s the last step of the sales funnel, you can do even better if you can sell to the same customer over and over again. When people like what they have got they are more likely to purchase from you again. However, even if people have a great product and follow all the steps businesses often fail because they sell to the wrong audience or try to sell what people don’t need. That is where you can implement survey funnels into your system. 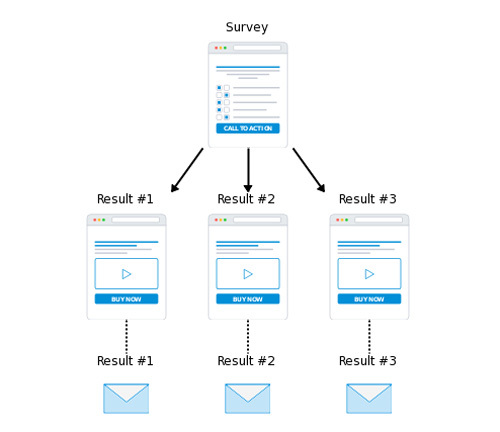 The structure of the survey funnel is similar to the sales funnel. Your goal is to segment the audience that comes to you and suggest the product that is more relevant to them. Creating your surveys in the form of a quiz makes them fun and interesting and will inspire more people to participate. Ready to create your own survey funnel quiz? Make one now! There are many ways to use segmentation. The whole idea of the surveys to increase sales is to learn more about your audience, their preferences, their experience with your product so you can understand what they need and how best to reach them. 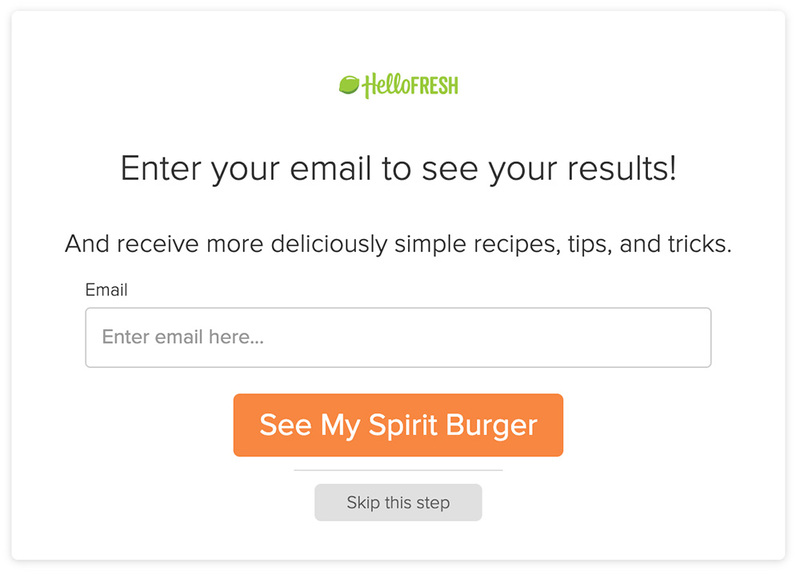 Here are five creative ideas to create a survey funnel that Hello Fresh uses to direct people to the sales and provide a better service for your customers. Ideally, you should already have an avatar of your ideal customer. If not, then think about the people who you want to work with and who you target to. Let’s say you have three offers on your site. Identify three groups of people based on your ideal client avatar that share common attributes that align with what you sell, like lifestyle, demographics, hobbies, etc. 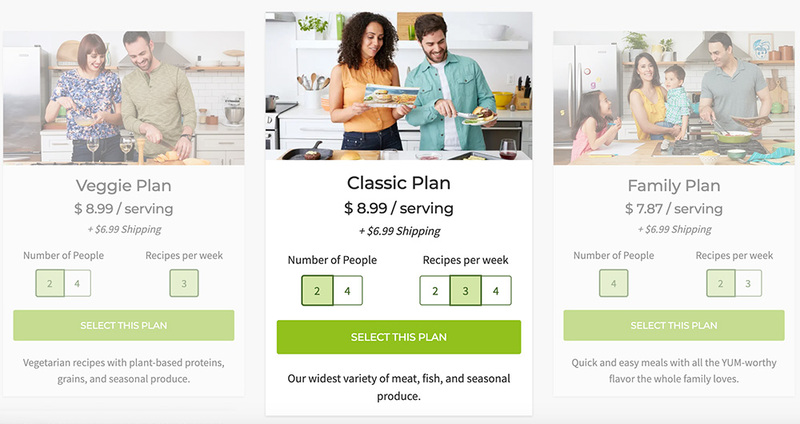 As an example, Hello Fresh provides everything required for making meals with no preparing and shopping. It has a subscription business model with regular delivery of the home-made meals. It offers three packages for the next groups of people: vegetarian, regular meals for a small group of people and a family plan. The survey funnel includes the quiz that segments people to different groups. Be creative in putting together the questions. 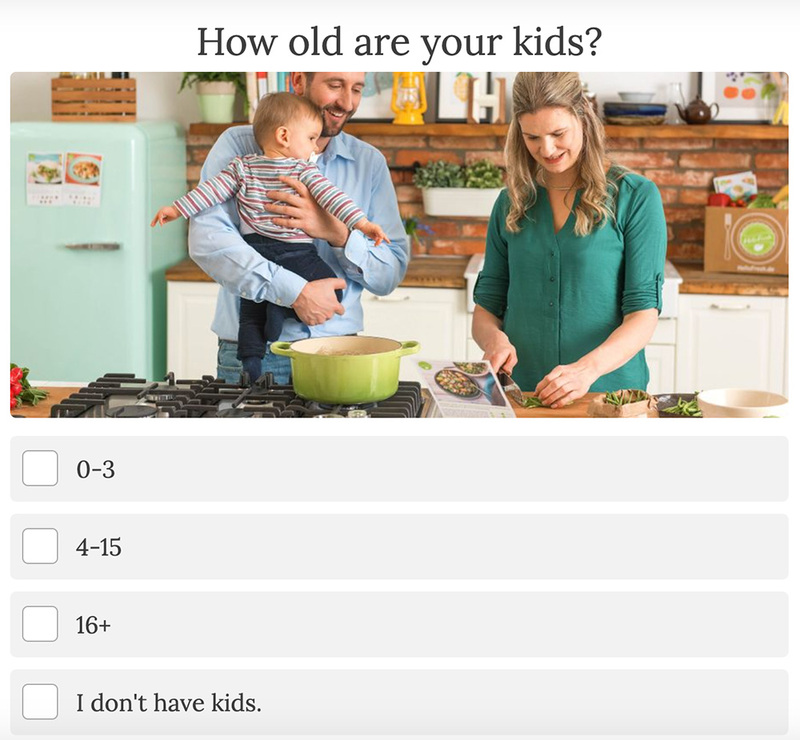 If you choose that you don’t have kids on How old are your kids? then probably the Family Plan isn’t for you. Or if you pick the image with the toys, then probably you have kids and you may be interested in the Family Plan. After you finish the quiz, you will be offered the most suitable plan with the link to the recipes and option to select a plan. If none of your answers included meat, then more likely you’ll be interested in a Veggie Plan and that is what you get as a result. Holiday seasons are well known as the time for sales. Or to increase your profit during the holidays you can repackage your product or service as the seasonal deal or offer a product that is suitable for the holiday. One of the options is to help people to pick the present for their friends. When holidays come and folks start shopping for gifts, for some it turns out to the difficulties as they may not have the time or they don’t know what to buy. 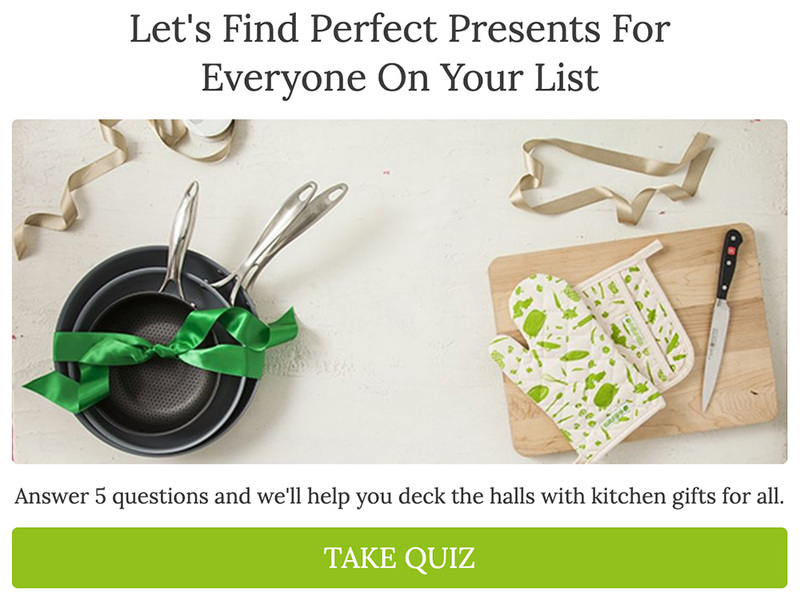 Create the survey to know more about the person’s preferences that will lead to one of the special offers like in The Ultimate HelloFresh Holiday Gift Guide quiz. and the one who is receiving it. Give the recommendations in the end with the link to shop for the product. Whether it is a holiday time, you want to attract a new customer or sell something else to your existing clients the discounts work everywhere. 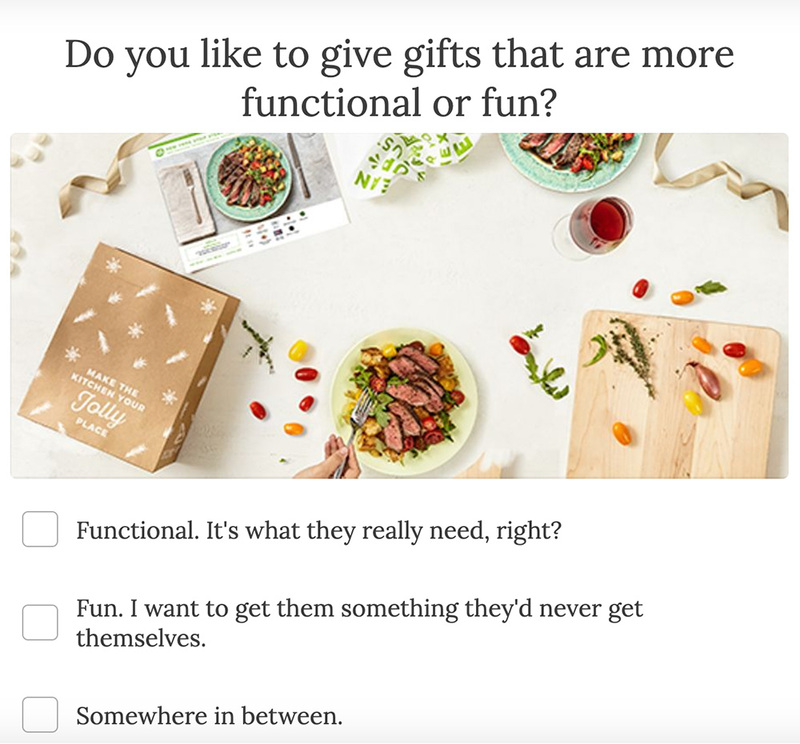 When you integrate a quiz into your survey funnel you can hit two targets: learn more about people’s preferences and get extra sales. 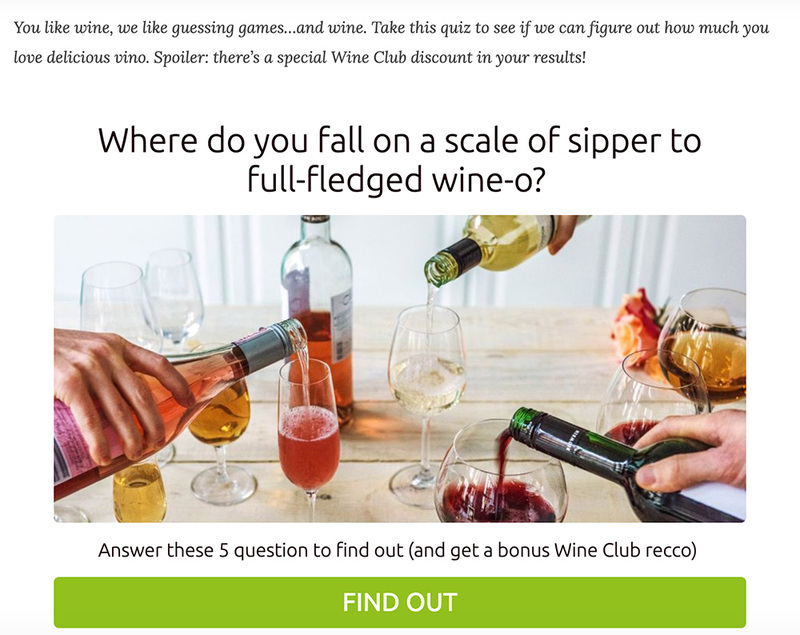 To encourage more people to take a survey you can mention right in the beginning that there is a special promo code in the end like in this wine quiz. 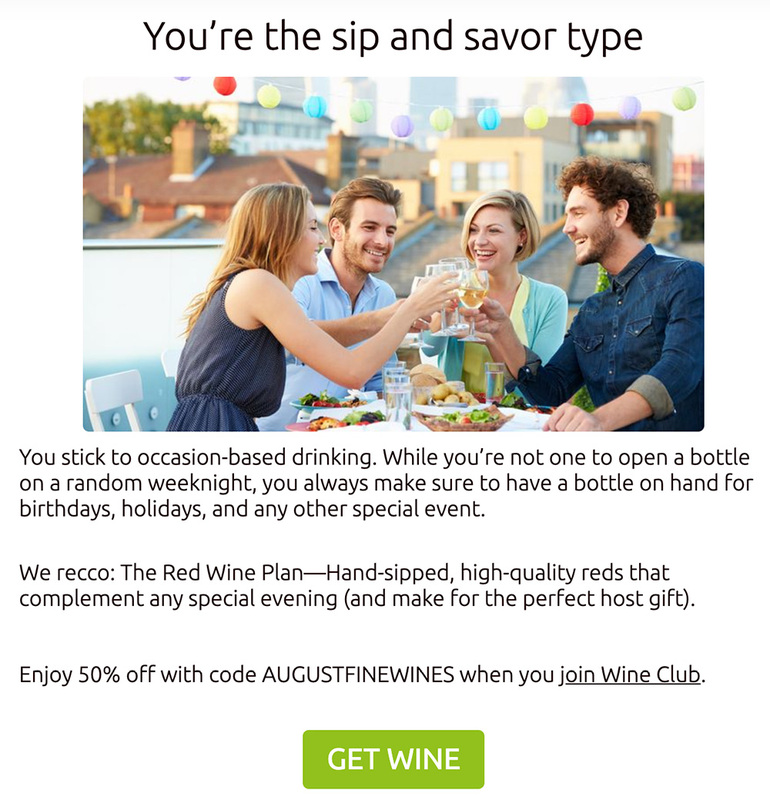 In the end, people see a short description of what type of person they are, the recommendation of the wine, discount code, and call-to-action to get the wine. Another way to grow your audience and increase sales is to partner with other companies. 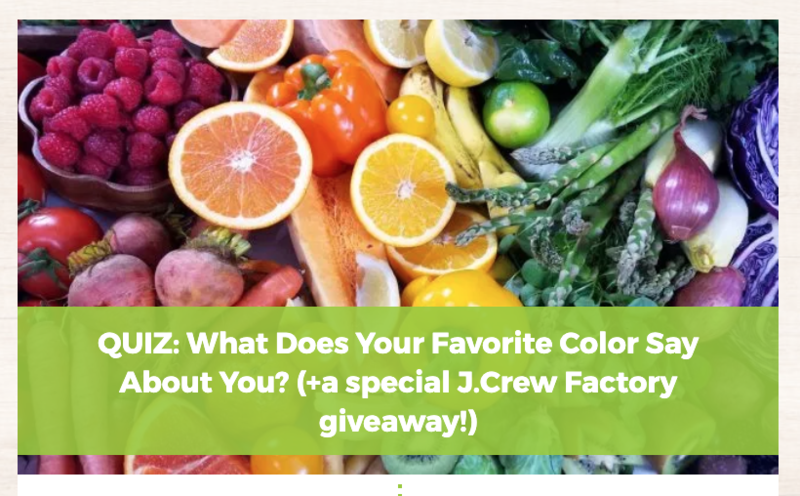 This time Hello Fresh cooperated with J.Crew Factory to give away a $100 gift certificate. Hello Fresh came up with the quiz What Does Your Favorite Color Say About You? 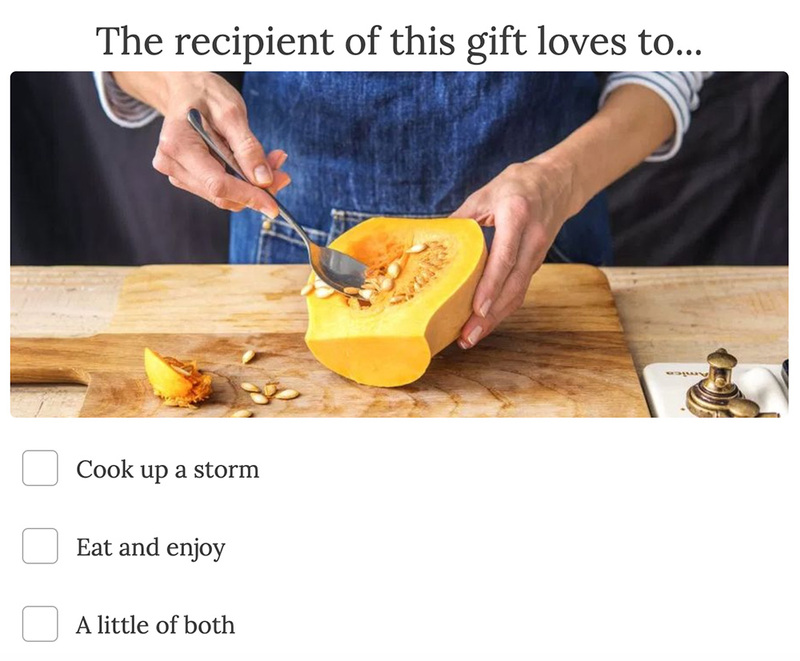 that takes people through the questions related to food. 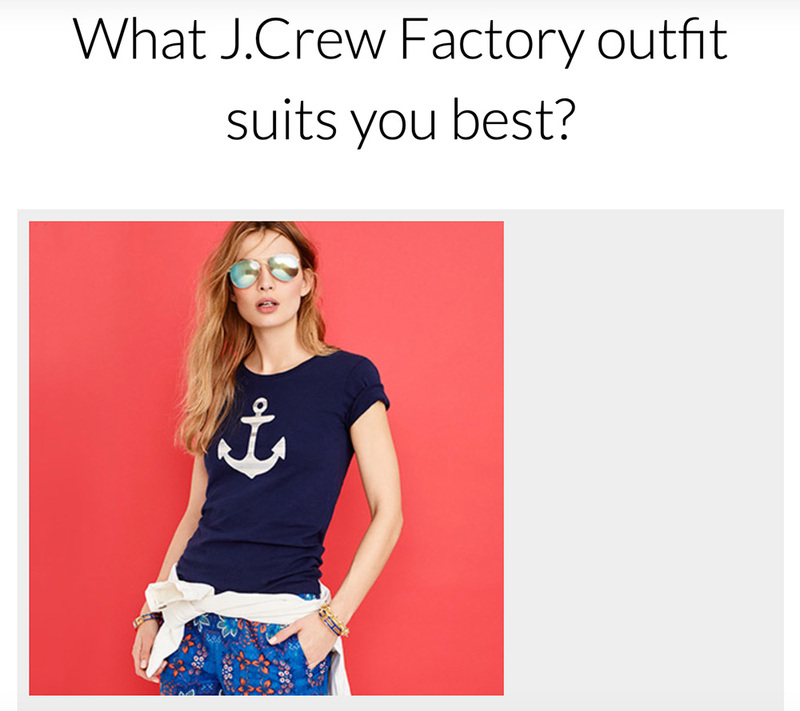 Including one about preferable J.Crew Factory outfit. The conditions for winning a giveaway is to take a quiz, then share the page and comment on the post. 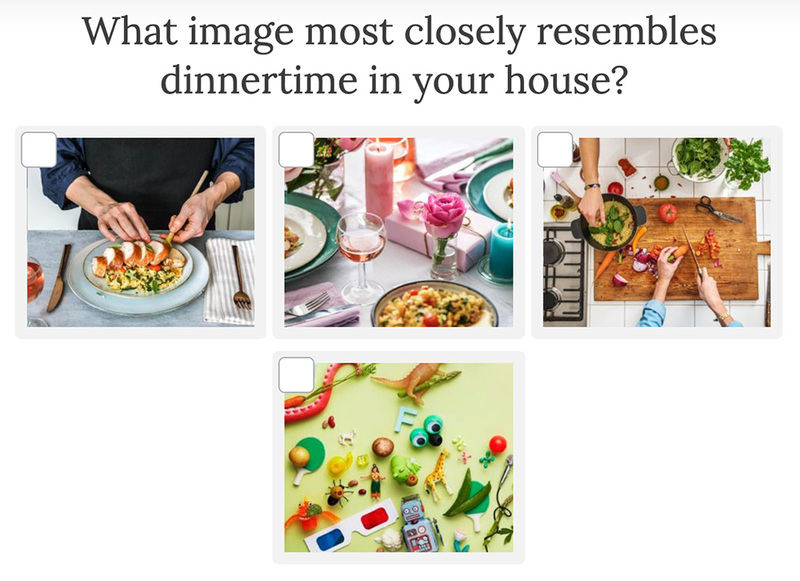 Simple questions combined with the colorful photos make a quiz easy to finish. The comments show that other people participate so the person who comes to the page will feel more comfortable to engage with the quiz. And after all, asking for share gets the quiz in front of more people. If both parties actively promote the giveaway, it is often a win-win tactic. Additional option to collaborate with similar survey could be to ask people to leave the email at the end of the quiz. 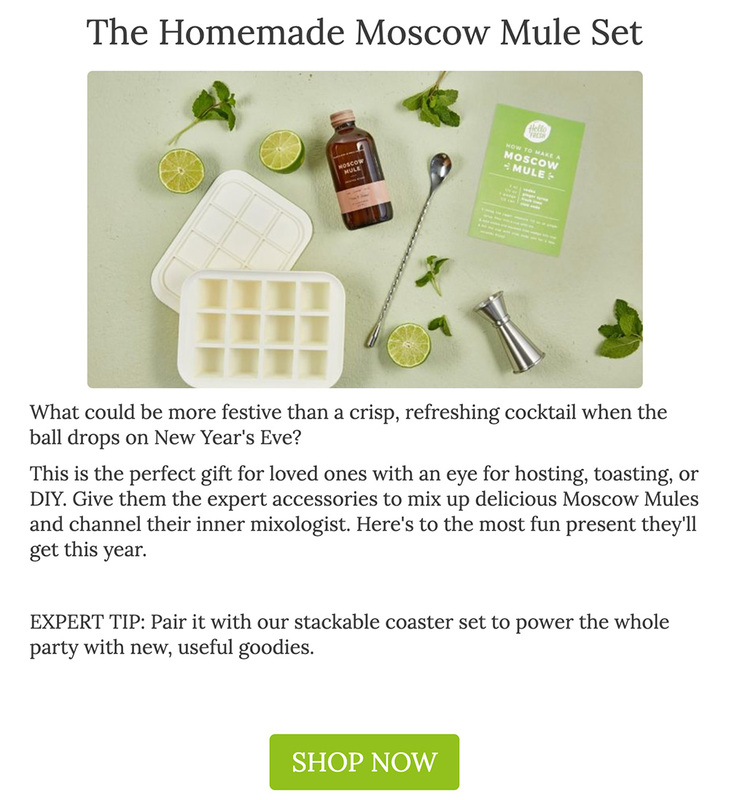 Then both companies could use the data of the surveys to follow-up with the emails or unique promo code for the product that may fit the potential client. 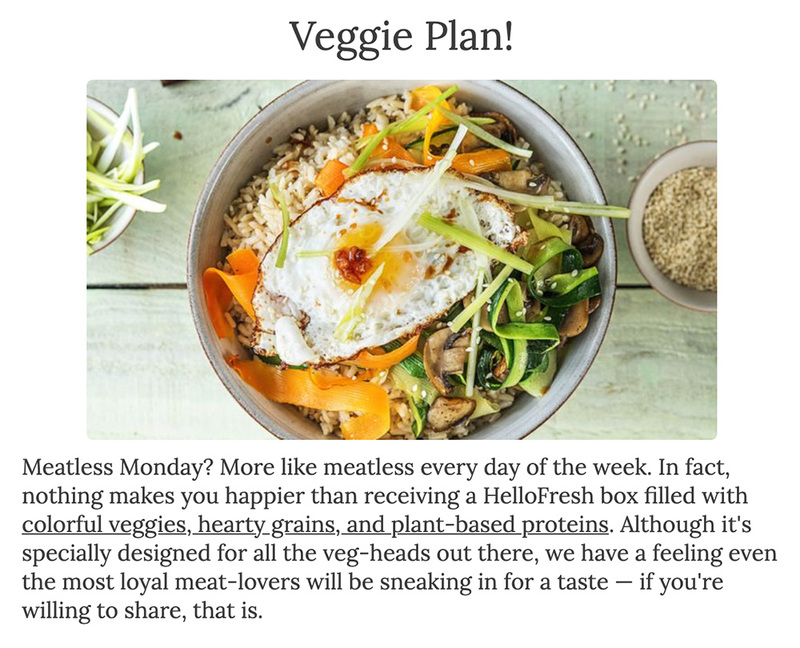 As you noticed, Hello Fresh actively uses quizzes to engage with people and learn more about their audience. 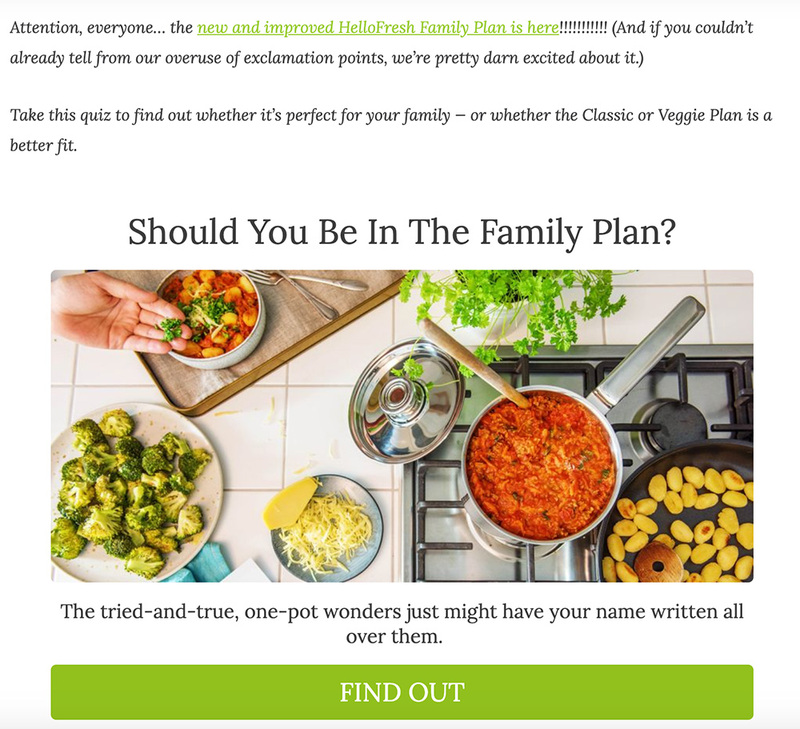 Even if you use quizzes to lead directly to the sales page nothing stops you to have another one for growing your email list. Show what value people get after giving you their email. Include the questions that will help you to segment your audience, integrate the answers with your email service and plan your email campaigns, regular offers, and sales for the selected group of people. Once you get your process working and have the product that your customers like, a landing page and a follow-up system that helps you to convert leads to customers, it is easier to scale your business. For example, after testing you know that from 100 people who saw your page 10 become your leads and 1 buy your product that costs $100. Let’s say you use Facebook ads to drive traffic to your survey page. If you spend $50 on advertising to attract those 100 people to your landing page and one of them buy your $100 product you will make $50 profit. Then by simply scaling your offer, you may get more profit. Creating the survey funnels allow you to better understand your consumers and as a result, build a better solution for them that will increase your sales. 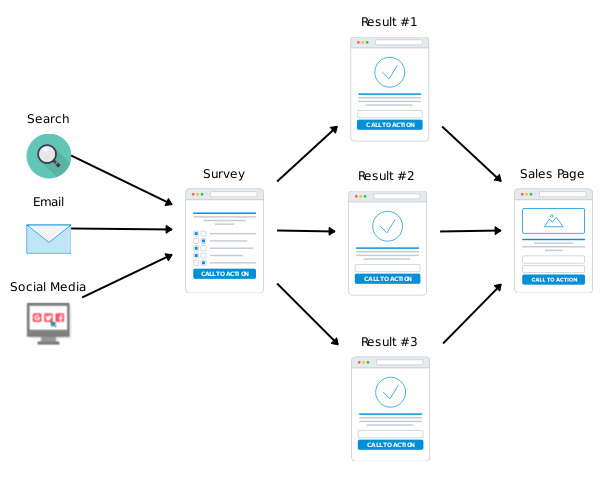 Use services like Funnelytics to map your survey funnel. Analyze the results of each step to improve your process. If you have only a few sales, see which stage of the funnel performs badly. Don’t have many leads? Maybe you don’t have enough traffic on your site. Or check your Interact quiz analytics to find out if people leave in the middle of the survey. Do you have leads, but not many people buy? Track how well your emails perform and convert to the sales. When you find the working system, you’ll get more traffic to your landing page and sell more. If you have any questions about implementing the survey funnels, just leave me a comment below.